Officially powered by 3900 Alton and Tequila Herradura Ultra, the event kicked off a series of curated experiences at POWERHOUSE'S official gallery space that will take place until Sunday, commencing with the showcase of Laura Kimpton's universally recognized sculptures. The gallery space was originally discovered by Compass's modern real estate platform utilizing their premier technology. 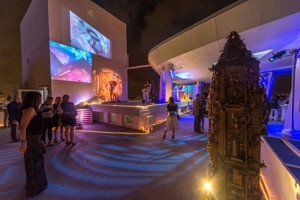 Party-goers sipped curated libations from Tequila Herradura Ultra and danced the night away to tunes by DJ Meandisco, all while getting a chance to view Laura Kimpton's iconic sculptures and film installations. Notable highlights included when Philippe Hoerle-Guggenheim and Laura Kimpton were able to sneak Bosh away to the official gallery pop-up space showcasing many of the HG Contemporary artists throughout the rest of Art Basel. He had no idea that Bosh and his wife, Adrienne Williams Bosh, were such art connoisseurs and they loved hearing the stories and inspirations "behind the art."